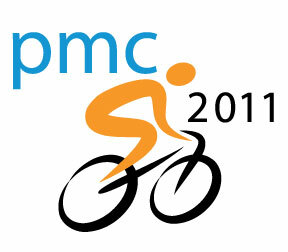 It’s that time again – the Pan Mass Challenge is coming up the first weekend of August, and this will be my twelfth year as part of the PMC. Every year, riders along the 2-day, 200-mile route are part of a village on wheels that comes together to fight cancer. The 5000+ riders, and the volunteer bike mechanics, massage therapists, folks who prepare and serve food and drink, folks who come out in droves to cheer us on, and say “Thanks for riding,” all join together in support of a cause. We need your help to support this cause — the Jimmy Fund at the Dana Farber Cancer Institute. My son Michael has two rides under his belt, and he’s joining me again this year. Last time we did the full ride together he finished both days hours before I did, as I was recovering from a herniated disk. I did a shorter ride last year, but this year I’m ready for the full ride once again. I’m counting on you to help us out, and to help the cause. As a cancer survivor, I know how important this cause is. I’ve benefited directly from the high-quality care provided by the Dana Farber and its affiliates, and I know that too many of us have had occasion to benefit directly or indirectly from the care and research that sustains us and our loved ones. I’ve also seen too many people die of cancer. I don’t want to see it happen any more. This scourge called cancer runs through all our families and communities, and we’re riding to make it stop. Please support Michael in his ride too. In my years of riding, I’ve been able to raise — with your help — about $65,000 for the cause. Thank you. Since 1980, the PMC community has raised over $500 million for the Dana Farber. The group goal this year is $45 million. Once again, please join us. And please follow along the first weekend in August – whether you’re by the side of the road, or following along at home via Twitter, on TV, or simply sending us your good vibes, we draw strength from your support.